Nita, Sam, Marni and Mark (not pictured) represent NOFS on Saturday at Voinovich Park. Sam and Lisa brave the elements at the opening of Ingenuity Fest. NOFS will be at Cleveland's Ingenuity Fest behind the Brown's Stadium this year. We hope to show the contributions made to science and culture by past and present Freethinkers along with a little of our own inventiveness. Check out this fun event October 2nd to 4th and be sure to stop by our booth! Click here to preview the ad. The Freedom From Religion Foundation, which debuted its TV ad featuring Ron ("not afraid of burning in hell") Reagan last year on "The Daily Show" and "The Colbert Report," is running the commercial again this week as a farewell to departing "Daily Show" host Jon Stewart and his irreverent wit. The ad will play on Stewart's next to last show Wednesday. "Honestly, we couldn't afford the rate being asked for ads running on the last show," admitted FFRF Co-President Annie Laurie Gaylor, "but we're pleased to run the ad live one more time nationally before Jon retires." 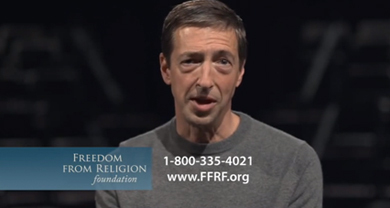 In the 30-second ad, Ron Reagan identifies himself as "an unabashed atheist" who is "alarmed by the intrusion of religion into our secular government. That's why I'm asking you to support the Freedom From Religion Foundation, the nation's largest and most effective association of atheists and agnostics, working to keep state and church separate, just like our Founding Fathers intended. Please support the Freedom From Religion Foundation. Ron Reagan, lifelong atheist, not afraid of burning in hell." Comedy Central has promised to pull out the stops on all its shows this week. The ad will run during the Aug. 5 show, which starts at 11 p.m. Eastern. FFRF's TV spot has been refused by national CBS, NBC, ABC and FOX. THANKS TO YOUR GENEROUS DONATIONS AT OUR FUNDRAISER IN 2015, WE HAVE COORDINATED WITH FREEDOM FROM RELIGION FOUNDATION AND CLEAR CHANNEL OUTDOOR TO ERECT A BILLBOARD IN TIME FOR THE REPUBLICAN NATIONAL CONVENTION IN 2016! THIS BILLBOARD WILL BE A TESTAMENT TO REASON AND SECULARISM. STAY TUNED FOR FURTHER DETAILS! 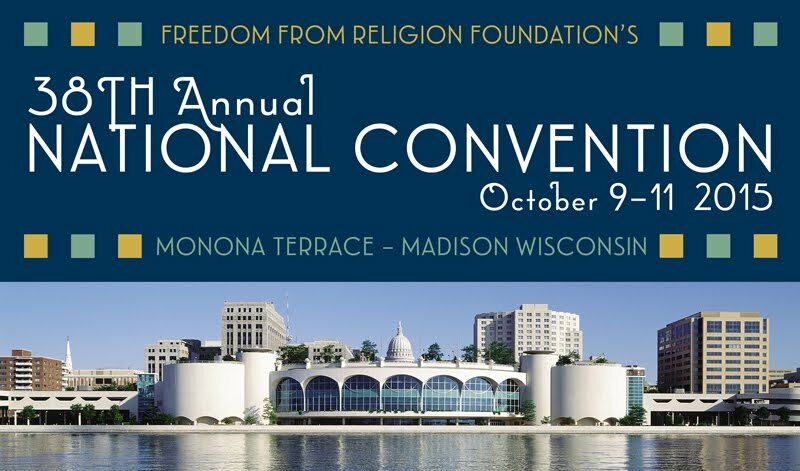 The 38th annual Freedom From Religion Foundation conference will be held October 9-11, 2015 at the beautiful Monona Terrace Conference Center in Madison, WI. If you'd like more information, please visit our Meetup event page!